Students have a variety of needs when it comes to the study of English. 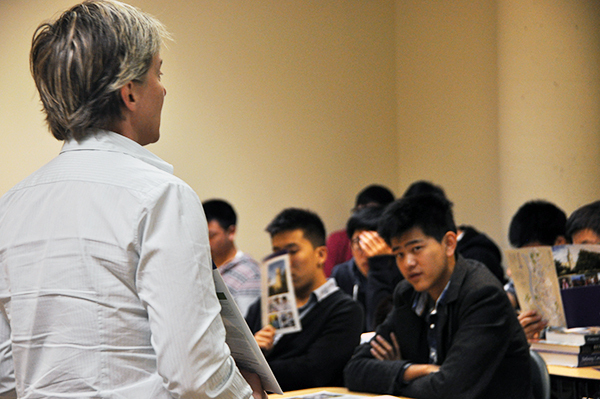 For some students, it is essential to work on English fundamentals, while for others, the focus is on academic English and the communication techniques that university study requires, such as essay and report writing, presentations, group discussions. Others need to polish their business English skills in order to jump start their professional careers in an international environment. We have programs to accommodate all of those needs. Our intensive seven-week modules come in a variety of subjects, with difficulty levels ranging from elementary to advanced. General English courses provide a comprehensive foundation in writing, conversation, pronunciation, reading and listening skills. Academic English courses are designed to take students to a whole new level of English proficiency to enable them to succeed in university courses developed for native English speakers. Business English courses target those students who plan to be involved in international business. The course embraces all aspects of business communication, from preparing common business documents to effective employment interviewing strategies. When students are admitted to Ontario International College, they are required to take the English Placement Test. After reviewing the test results, our English department decides on the appropriate ESL level for each student. At the end of each module, students take the English Benchmark Exam to find out whether they progressed enough to move on to the next level. All ESL instructors are highly qualified professionals with degrees from top Canadian universities. Not only they hold TESOL certificates from leading Canadian institutions, but also they are experienced in teaching ESL to international learners. On top of their professional expertise, they are friendly, approachable, and eager to help. One of the focuses in the basic class is learning vocabulary through speaking and listening to various media resources such as, movies, videos, and music. Students learn new words in order to be able to identify main ideas and details when listening to radio, news, and other media excerpts. Lessons are planned and designed according to the Ministry of Education ESL curriculum. To fulfill curricular expectations teachers use but are not limited to units from the North Star textbook. Teachers are also encouraged to incorporate into their teaching current events, and students’ interests to make the learning more authentic and applicable. Finally, the size of the basic class is kept small so that the students receive the necessary attention in order to succeed in the next level. The central focus of this level is to equip students with essential reading and writing skills. Thus, students will learn to identify main ideas and read for details in short texts, make inferences and read a chart. Readings range from informational brochures and newspaper articles to letters and interviews. Vocabulary exercises tackle issues such as, word definition, context clue use, vocabulary classification. Concomitantly, the grammar exercises introduced (e.g., the simple present, past, and future tenses), help students with their writing pieces. The writing section of this level proposes writing assignments such as, completing sentences, making a list, composing a letter to the editor. Students learn new vocabulary words and phrases used in our social culture today (slang and idioms); moreover, more time is spent on pronouncing words properly and using the newly learned words correctly in sentences and appropriate contexts. Students are taught speaking skills such as, word stress and intonation, as well as socializing skills such as, disagreeing with others and asking questions in polite ways. Students are taught to hear tone of voice which conveys different meanings and emotions; they also practice listening to main ideas and details with speakers in the listening activities talking at a faster pace. Lessons are planned according to the Ministry of Education curriculum expectations and guide lines. At this level, students utilize various tools and strategies for understanding the reading selections. They will search for main ideas and details in various literary selections (e.g., academic articles, blogs, and newspapers). Students will also integrate reading skills such as, unifying the theme of a reading, contrasting two readings of other different genres. The level focuses on developing the students’ writing skills as well with emphasis on building vocabulary through practicing, expanding the use of it, and ultimately using it creatively for a variety of purposes (e.g., opinion and descriptive paragraphs, persuasive letters).The grammar section of the writing component offers a concise presentation of various grammatical structures. This level is designed to offer students a grasp of fundamental grammatical issues at a higher level of difficulty. The textbook exercises present authentic language in a variety of real-life formats (e.g., magazines, web-pages, questionnaires). The textbook proposes a contextually integrative approach to acquiring grammatical knowledge – as such, students can listen to the exercise text on audio CDs in order to get accustomed to recognizing the sound of various grammatical structures in a natural context. At the end of each chapter, the textbook also presents an extra chapter dedicated to incorporating grammar into writing – the writings pertain to theoretical issues contained in each chapter such as, modals and similar expressions, nouns and articles, adjectives and adverbs. At this level, students possess the vocabulary necessary to be able to carry a simple conversation in a variety of situations. One of the areas stressed is learning the skill to articulate and support one’s opinion and, or argument. Students in this class discuss various issues and topics provided by the North Star textbook and the classroom teacher. Students learn new vocabulary and practice using it in authentic situations, such as debates, panels, interviews. Although students continue to acquire knowledge and improve their listening and speaking skills, the class particular focus is the shift from using English as a means of social communication to using English for academic purposes. Therefore, students learn to apply spoken English differently depending on the context. In the intermediate division there is a higher integration of reading skills such as, predicting, drawing inferences, and analyzing into text book material. Genres of reading include magazine and academic articles, blogs, and news pieces. There are multiple perspectives on the reading of articles which engage students’ interest in developing participation in open-ended questions, information systematization, and individual expression. Students follow the writing component of the course in order to be able to compose a variety of written pieces of different genres while incorporating the grammar and vocabulary pertinent to the level. The textbook focuses more intensively on the controlled (e.g., recognizing and editing typical grammatical errors) and communicative practice (e.g., listening practice oriented towards overall comprehension). While students expect and need to learn the formal rules of the English language, it is essential that they practice the structures learnt in various contexts in order to internalize and master them. The textbook provides an abundance of both controlled and communicative exercises so that the students can bridge the gap between knowing grammatical rules and using them. The many activities of each unit provide opportunity for critical thinking while enabling students to personalize what they have learnt. This level integrates grammar, vocabulary, and culture into the units, providing students with systematic and multiple exposures to language forms in a variety of contexts. Listening activities at this level engage students, connect them to language used outside classroom, and encourage personal opinion and critical thinking. Comprehension activities not only lead students to an understanding and appreciation of authentic materials (e.g., radio report, lecture, other genres), but challenge the students to use appropriate language skills to analyze and express their ideas as well. Thus, students will practice more skills that are essential for success in authentic academic settings and on standardized tests. Students will read and evaluate various types of texts. The course addresses transition to more complex academic skills such as, critical and analytical skills, synthesis, and information classification. In particular, the critical thinking component aims at enhancing essential reading skills such as drawing logical conclusions, finding correlations, differentiate between main ideas and details. The analytical component aims at developing skills such as, re-evaluating assumptions, analyzing the development of an argument, recognizing the weight of details in supporting the main idea. In the writing section of the course, students become engaged in research and inquiry tasks that prepare them for a variety of academic purposes. They then learn revising techniques at sentence and paragraph level to help them move towards coherence and unity in their writing. The primary aim of the course in general, and for this level in particular is for students to gain confidence in their ability to speak and write English accurately and fluently. More focused practice suggests a variety of exercise types that guide students from recognition to accurate production of the grammatical structure (e.g., discover the grammar: list the simple past irregular verbs in the opening reading). Emphasis is placed on the writing process which displays a rather academic content pertaining but not limited to issues such as, the sentence structure, writing direct and indirect speech, punctuation of adjective clauses. Through fundamental skills such as listening, reading, speaking, and writing, the unique methodology offered by the Focus on Grammar series helps students understand and practice English grammar. The information and activities of this level promote superior integration of critical thinking, and an enhanced focus on academic skills such as, synthesizing, drawing inferences, and note taking. Students are challenged to take what they have learned, organize the information, and synthesize it in a meaningful way. The culminating productive task – mastering the students’ listening skills and spoken language - galvanizes content, language, and critical thinking skills. By building skills and exploring ideas, the exercises help students participate in discussions and sustain conversations of an increasingly and sophisticated nature. At the advanced reading and writing level, students implement critical thinking, analysis, synthesis, and inference in order to enhance academic skills and gain success in class and on standardized tests. Types of reading materials include academic articles, literature, and other genres. The vocabulary section leads students from reviewing to acquiring new vocabulary, practicing and expanding creatively the use of it. The grammar section offers a concise presentation and targeted practice of useful structures for writing (e.g., collocations: nouns and verbs, identifying adjective clauses, discourse connectors expressing cause and effect). The integrated writing section will lead students through the writing process with engaging writing assignments focusing on various rhetorical modes. The course proposes a multitude of writing techniques and procedures and enhances technical terminology already acquired in prior levels (e.g., figurative language, word semantics, and conciseness). Emphasis is placed on the most important aspects of the writing process such as, paragraph and essay organization, the thesis statement, and the audience with content and logical progression at the core of the writing strategy. Planning and shaping, drafting and revising, editing, are among essay writing techniques central to the Essay Writing course. Other course features are devoted to establishing context for writing, evaluating sources, relating critical thinking to writing. The course offers a variety of information aimed at developing the students’ ability to write and communicate clearly.